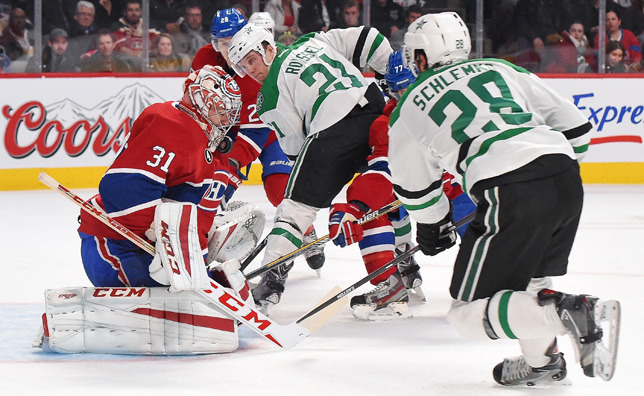 MONTREAL – Even a little vacation rust couldn’t stop the Habs from picking up two points against the Stars. Having gone their separate ways to relax and recharge during the All-Star break, the Canadiens were back at the Bell Centre looking to pick up where they had left off a week earlier. Like any vacationers returning to work after a few days away from the office, the Habs took some time to hit their collective stride from a productivity standpoint on Tuesday night. Luckily, kicking aside quality shots from All-Stars is nothing new to Carey Price, who spent the weekend in Columbus doing exactly that. “Carey was solid for us again. We still scored three goals, which is a good sign, but you could tell it was the first game after a five-day break,” admitted head coach Michel Therrien, whose team was outshot by a 42-26 margin in the game, but still came away with a 3-2 win. “Our execution wasn’t there. At times, our concentration wasn’t there, either. Enjoying a rejuvenated power play of late, having now gone 5-for-12 in the last three games, the Habs leaned heavily on special teams against the Stars. In addition to potting the game-winning goal with the man advantage, the league’s fifth-ranked penalty kill unit faced two 5-on-3 Stars power plays in the game – including one in the final five minutes – all without the services of Alexei Emelin, whose night ended with a game misconduct penalty in the second period. Before pucks even have a chance to mark up Price’s pads these days, his teammates have been doing everything they can to keep them away from the four-time All-Star. “We have guys who are willing to block shots and that’s probably the biggest thing about it, that we’re getting in lanes and we’re willing to pay the price,” underlined Price, whose teammates have blocked 795 shots this season, good enough for fourth in the league in that category. Earning first-star honors in his first game back from the break, Price was happy to see a tighter defensive system in front of him than the one that led to a 17-12 win for Team Toews over Team Foligno at the NHL All-Star Game on Sunday. Facing over 40 shots on Tuesday for just the second time this season, he wouldn’t mind seeing a little less rubber going forward, but his approach is the same no matter how many pucks are fired in his direction. “It’s a cliché, but I take it one shot at a time and worry about the next one that’s coming at me. I just try to keep it simple,” he said. “We want to play good hockey. We want to be out-shooting and out-chancing our opponents as much as possible, but sometimes a team is going to come out hot and that team played very well tonight.